Hearts & Spools [H5061] - $10.00 : Yarn Tree, Your wholesale source for cross stitch supplies. Cross stitch pattern by Sue Hillis Designs. Book one from The Spoolies collection. Set of two patterns accented by hearts and cross stitch motifs. The first features the verse "Sew Many Hearts," and the second features the verse "Life's A Stitch." 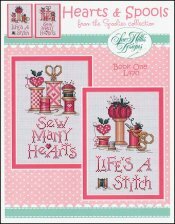 Stitch counts: Life's A Stitch 58 x 92 and Sew Many Hearts 52 x 89.